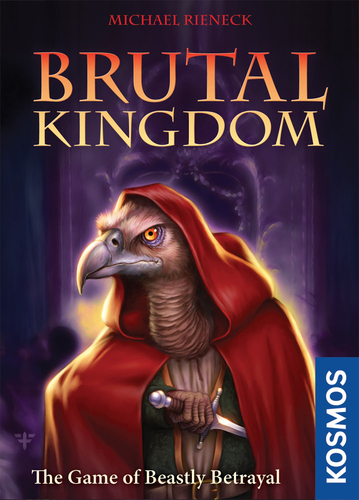 In Brutal Kingdom, players take on the role of different animal characters, trying to use their influence to take control of the royal court. There are twenty different character cards in the game – there are ten with light backs and ten with dark backs. Each set of ten is shuffled separately to start the game. They are all seen on a pair of overview cards which also show which characters can eliminate which other characters. 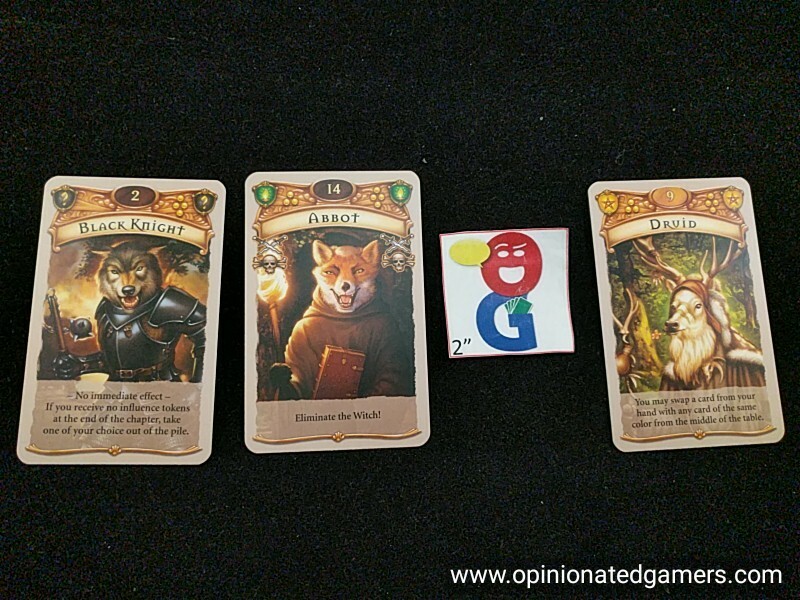 Furthermore, all influence tokens and elimination tokens are placed on the table. The game is played over four chapters, and there are four rounds in each chapter. At the start of each chapter, each player is dealt two cards from both the light and dark backed character decks. 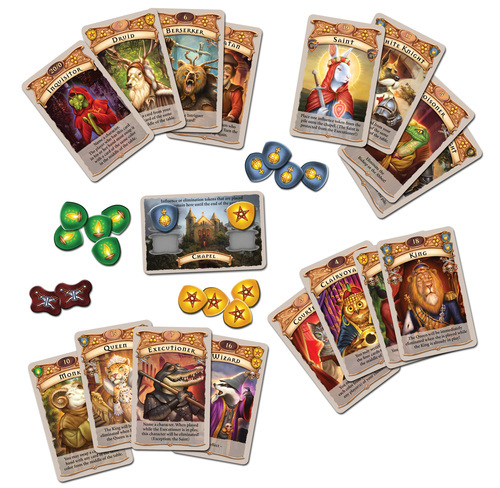 In each of the four rounds in this chapter, the player will choose one of these cards to play – thus all will be played at the end of the chapter. When playing cards, the newest card is played on top of the stack of previously played cards so that you really only see the most recently played card. At the end of the chapter, any remaining cards (i.e. not eliminated) will be scored and you will get influence token matching the color of each influence icon found at the top of the character card. 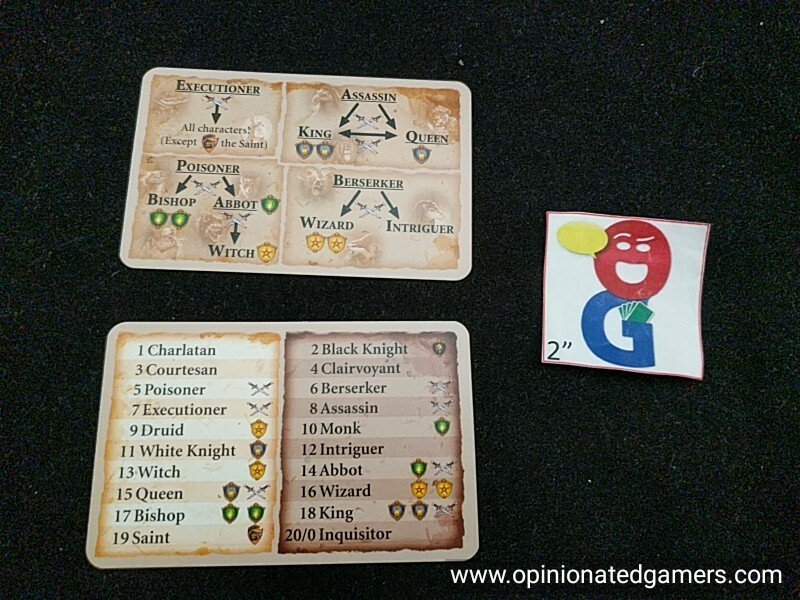 But before a chapter is played, there is a bit of action with the distribution of the character cards. Again, each player is dealt 2 cards of each type. This will leave two undealt cards of each type which remain on the table. 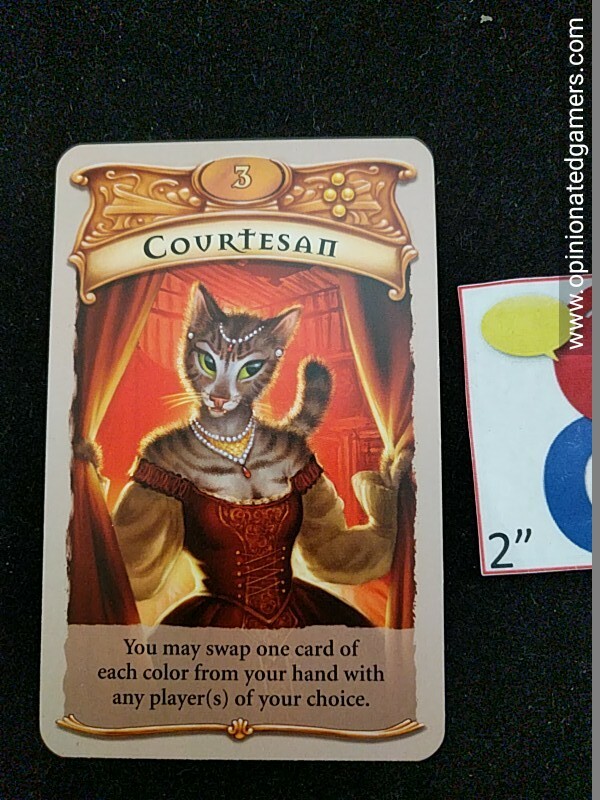 Each player first looks at their light colored cards and secretly chooses one card to keep in their hand and one to pass to their left hand neighbor. All cards are passed simultaneously. The same is done with the dark colored cards except that the pass it to the right. Thus, at the end of this, you will know one card in the hands of each of your neighbors (and they will know the same of their neighbors). Once all the cards have been distributed, the chapter can begin. Starting with the player who holds the “Start Player” card and going clockwise, each player chooses a Character card from their hand and places it face up on the table in front of him. The played cards are reviewed, and the player with the highest face up rank takes the “Start Player” card and will lead play in the next round. This method even determines starting player at the end of one chapter and through the first round of the next, so make sure you figure out who gets the “Start Player” card before the cards are cleared! As you play a card, you follow the instructions written on the card. Some of the cards have conditional effects: “you may…” – if you play one of these, you can decide whether you want to take those actions or not. Some of the cards played can cause the elimination of an opponent’s stack (based on the card currently visible on top) – if this happens, the eliminated player must flip over his entire stack of cards played to that point in the round. The actions written on the card generally only take effect as they are being played – except the King, Queen and Executioner. All cards which could possibly be directly eliminated have a skull on them as a reminder; players can also refer to the reference cards to see which characters can eliminate others. Every time you play a card which directly eliminates another card, you get a 1VP token as a reward. At the end of each chapter, players look at all of their remaining face-up cards and take influence tokens matching those shown in the upper corner of their face-up cards. This is done in turn order from the new starting player – if the supply runs out, tough luck for being later in turn order. The cards are then collected and re-dealt for the next chapter. There is a card called the Saint which allows you to play an influence token to the Chapel card. If the Saint wasn’t in play in this round, place an elimination marker on the Chapel – if nothing else to keep accurate count of the rounds left in the game. After four chapters, the game ends. Players now score points for their influence tokens. Each token is worth a number of VP equal to the number of same colored tokens remaining in the supply OR on the Chapel. It is possible that a color is worth ZERO points if all of those tokens are in player possession at the end of the game. Each player also counts up the points they have from eliminations during the game and adds them to their total. The player with the most points wins. Ties go to the player holding the “Start Player” card at the end of the game or the closest to the Start Player card going clockwise. Brutal Kingdom is an interesting cut-throat game where timing is everything. There are a very limited number of cards, and there are plenty of cards that can eliminate others. As the Chapter progresses, you’ll do best if you can remember which cards have been played earlier in the round – you’d like to be able to play a vulnerable card only after all of the possible assassins of that card are already out of play (or you know that they are face down on the table). You’d like to make sure that you aren’t eliminated near the end of the round; because if you are, you might end up with no face-up cards at all for the Chapter! The card distribution phase is really important to your overall success. First, you have to choose which cards you’d like to keep and which you’d like to pass on. You also can gain some important information about cards in the hands of your neighbors – this may help you in deciding when it’s safe to play your own cards. I’ll admit that for some reason I continually forgot what I passed my neighbors, and I ended up not playing as optimally as I could have as a result. The artwork is well done and quite realistic. To be frank, some of the anthropomorphic animals are quite scary! I’ve always been a fan of Franz Vohwinkel, and this game holds up to his usual high standards. The cards are a nice oversized format – similar to Tarot cards – which makes them easy to read and identify from across the table. If you like games like Love Letter, this one will be for you. There is a strong take-that element to the cards and a lot of room for clever play with the small card deck. For me, I might prefer the simplicity of Love Letter as the deck is a bit more slimmed down. That being said, the larger deck in Brutal Kingdom gives you a longer game, 20-30 minutes, and one that feels like the player has more room for skillful play as opposed to luck of the draw.